OTTAWA - Health Canada is reminding Canadians that raw bivalve shellfish - such as oysters, clams, scallops, mussels and cockles - can carry bacteria, viruses and toxins that can cause foodborne illnesses if they are not stored, handled or prepared appropriately. Canada's Food Guide to Healthy Eating recommends that Canadians eat at least two servings a week of fish and seafood. However, as with all foods, it is important to store, handle and prepare shellfish and seafood appropriately to help prevent illness. In particular, children, pregnant women, the elderly and people with weakened immune systems (including people with liver diseases) are more susceptible to foodborne illness and should avoid eating raw or undercooked shellfish. 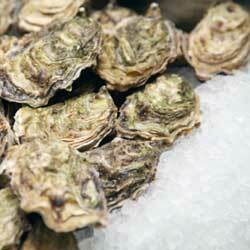 Buy bivalve shellfish and seafood from reputable sources, and keep them cold (below 4 °C). A retailer selling raw shellfish should be able to show you a shellfish shipper's tag. Only shellfish from approved sources with a shellfish shipper's tag should be eaten. Refrigerate these foods immediately after purchase. Do not put live shellfish in a closed container or into fresh water. Cover the shells with a damp cloth and place on the lowest shelf of the refrigerator. Store shucked shellfish in a closed container. Raw shellfish can be kept refrigerated for a few days, depending on their freshness and quality, and can be stored in the freezer for 2-4 months. Shucked oysters should be frozen if you do not eat them within two days. Check the packaging on frozen seafood. Make sure that the packaging is not torn or open and that there is minimal frost or ice crystal formation on the packaging. Too much frost could mean that the seafood has been frozen for a long time or has been thawed and refrozen. Place the frozen seafood in the freezer immediately after purchase until you are ready to use it. You should never defrost seafood at room temperature. Thaw food in the refrigerator, in cold water, or in the microwave if you will be cooking it immediately. If thawing in cold water, replace water every 30 minutes. Keep raw bivalve shellfish separate from cooked foods and follow good hygiene practices: wash hands before preparing foods, wash hands after handling raw shellfish, and wash counters and utensils with soap and warm water after preparation. Make sure your shellfish is fresh. Fresh oysters, clams, scallops, mussels and cockles should close their shells when you tap them. Shucked oysters (usually sold in tubs) are not meant for raw consumption. Boil oysters, clams, scallops, mussels and cockles until the shells open, and then boil for an additional 3-5 minutes. You should also boil or simmer shucked shellfish for at least 3 minutes or until the edges curl. Steam for 4-9 minutes and throw out those that did not open. Fry for at least 3 minutes at 190 °C (375 F). Bake for at least 10 minutes at 230 °C (450 F). If you wish to harvest bivalve shellfish yourself, make sure you do so in areas that are open for harvesting. Contamination due to impurities or natural toxins from marine algae can occur at any time of the year, and cooking will NOT destroy these toxins. Contact your nearest Department of Fisheries and Oceans office listed in the blue pages of your local telephone directory for information on areas currently open for bivalve shellfish harvesting. You may also want to check with your local or provincial government about harvesting restrictions or consumption advice for shellfish not purchased from commercial establishments. It is estimated that there are as many as 13 million cases of food-related illnesses in Canada every year. Many of these illnesses could be prevented by following proper food handling and preparation techniques.